Aloe Vera is a rather common ornamental house plant in Singapore and Malaysia. It can be an invasive species if not manage properly. Given enough soil nutrients, Aloe Vera can be quite sizeable. Common household usage are usually using its gel to protect the cuts and uncut wound (burns) where it is believed to promote soothing and healing of wounds. In addition, it is sometimes used as a home made skin care product. Not all species of Aloe Vera are edible, research shows that only 5-6 cultivars are edible and one of the most common type is an Aloe Vera cultivar with white spotted stem or Aloe Vera Chinensis. Though there are no confirmed scientific evidence that ingestion of Aloe Vera will bring direct health benefits, but traditional folk medicines have view the plant as herbs. Chinese traditional medicines have used Aloe Vera as laxatives to treat minor constipation problems and believed that it is good for digestive system and improve the appetite. HOWEVER, IT SHOULD BE CAUTIONED THAT ALOE VERA HAVE LOW TOXICITY AND SHOULD BE CONSUMED IN MODERATION. Though there are recipes that called for fresh aloe vera direct ingestion, it is advisable to DE-SKIN THE ALOE VERA AND ONLY CONSUMED IN COOKED. Aloe Vera Chinensis is now easily available in Singapore supermarkets under the fresh vegetables section and the price per leaf is about SGD2-2.50 each. These Aloe Vera are mostly imported from Thailand where they are grown commercially. My son and daughter loves the Aloe Vera cubes that commonly available in commercial drinks and yoghurt. It is a big deal for them if some drinks have aloe vera in it as an ingredient. 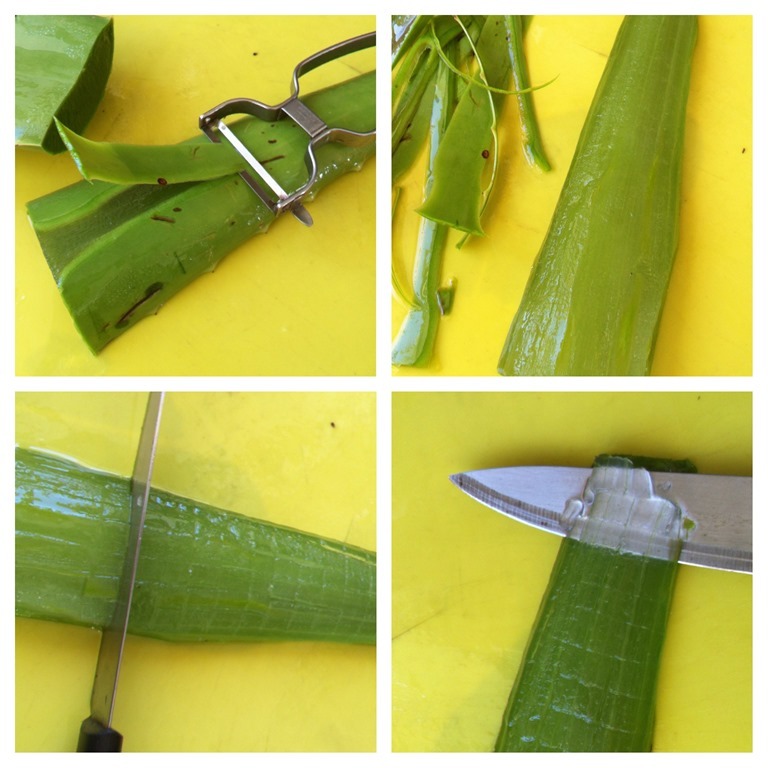 Knowing that this is something rather easy to prepare and I have a few guests at home now, I have decided to buy a piece of Aloe Vera leaf and prepare some sweet desserts for them. Note that this is the recipe that I have tried and tested based on my own creativity and those who tested it will it a thumb up. I honestly believe that this dessert will be able to fulfill of the palates of both Asian and non-Asian foodies. It is healthy, light and especially good to serve after a greasy meals. In today’s post, I do not think that it is necessary to detail the exact quantity of each ingredient as it is a matter of personal preference. I have started off with a piece of Aloe Vera leaf, two pears, some grapes, some oranges. As for side ingredients, you will need a bundle of pandanus leaves, some Chinese goof berry, red dates and some rock or granulated sugars. If you like fruits, just increase the quantity. Other fruits that can be considered are apples, papaya (not that advisable though since both aloe vera and papaya have laxative effects), kiwi fruits etc. Note that all ingredients mentioned here are substitutable and optional except Aloe Vera and rock sugar. Rock sugar can be substituted with white granulated sugar or honey. Of course, Aloe Vera should be changed, otherwise, this post will not exist. Use a kitchen peeler to peel of the skin and if you like, you may keep the skin and used it as a facial mask to moisturize your skin. You should only de-skin one side. The other side should not be de-skinned so that the skin can acts as a form to hold the aloe vera cubes as explained below. Take a knife and cut the flesh into cubes but make sure that the cubes still attached to the skin. Use the knife to cut horizontally or parallel with the skin. The aloe vera cubes should detached from the skin now. Transfer all the cubes to the a bowl of water and sieve it. The gel will start to flow out of the hole and your aloe vera cube is ready. In my demonstration here, as I personally do not like the gel as it is quite stinky (to me) and I have used a sieve to sieve off the gel. 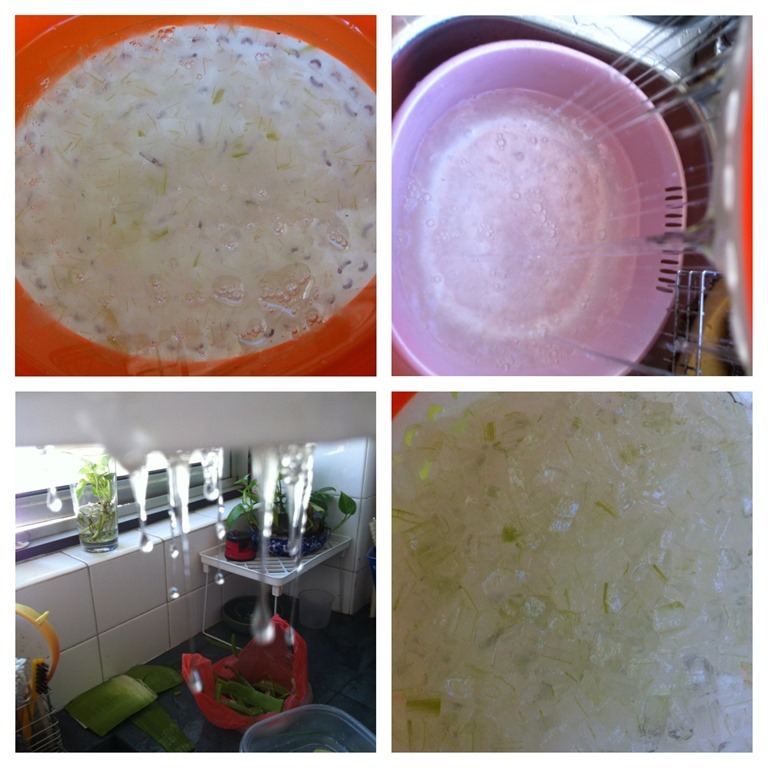 However, you can also cook the aloe vera cubes with the gel. If you like the gel, you can by pass this step totally. Clean and get ready a bundle of pandanus leaves. 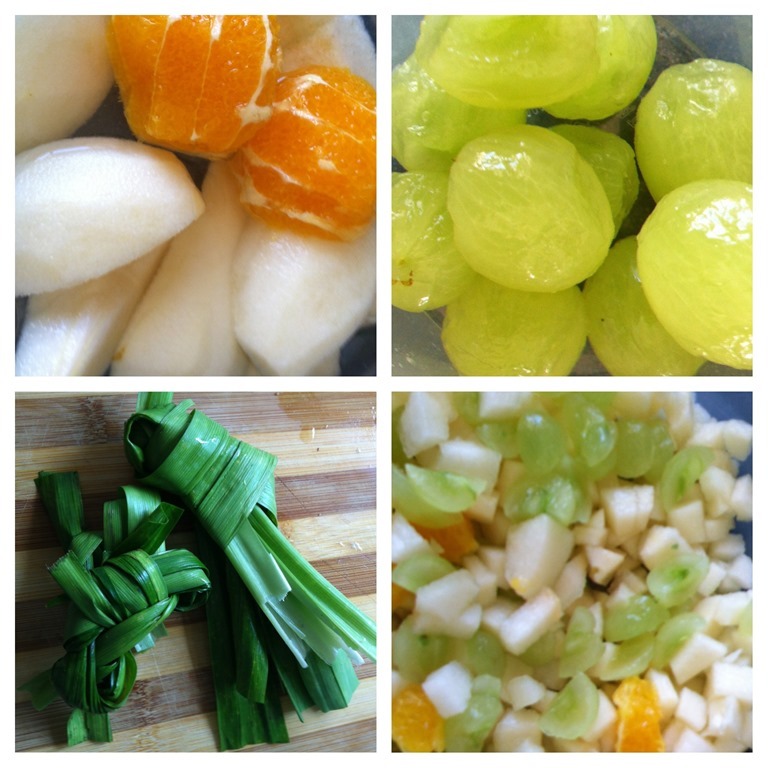 Peel off the skins of the fruits and cut it into cubes. As mentioned above, alternative fruits are apples, kiwi, dragon fruits etc. 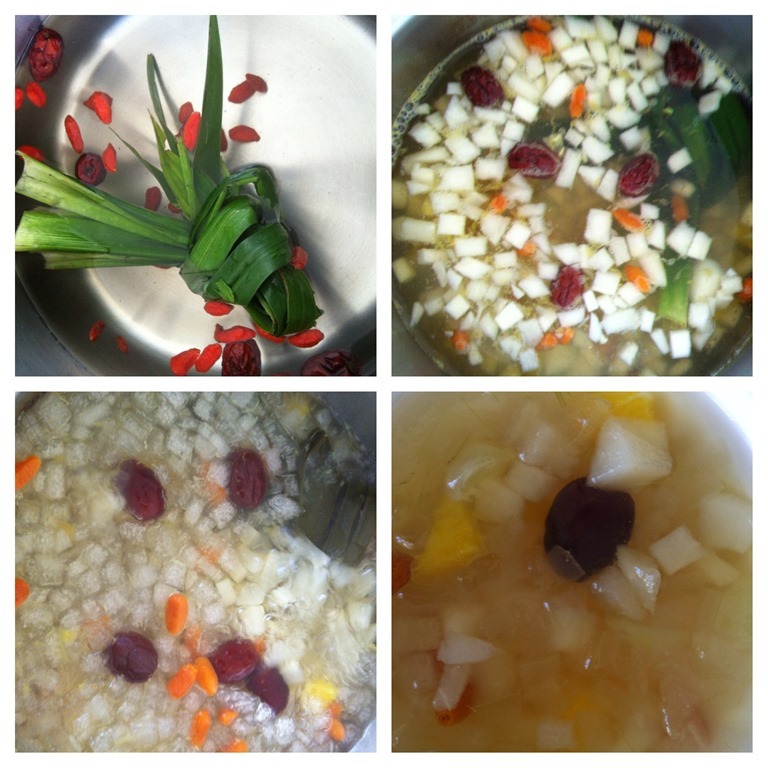 Have some water in a medium sized pot, put in the Pandanus leaves, Chinese goof berry, Chinese red dates and bring to boil under high heat for about 10 minutes. Throw in the fruits and boil under medium heat for 15 minutes. Note that the different timing of putting the ingredients. This is because their cooking time is different and some can be cooked very fast while others can stand long hours of heating (like oranges, red dates, goof berries). 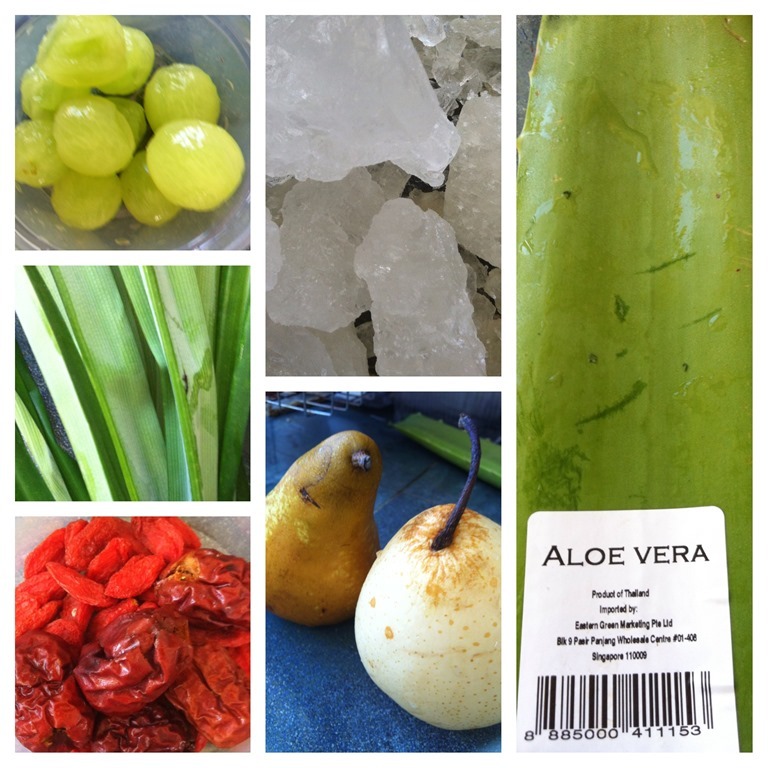 Pour in the cut aloe vera, add rock sugar, bring to boil and the dessert is ready. Red dates are a good iron source especially beneficial to ladies whereas Chinese goof berry is reputable to improve the eye sight. Aloe Vera is good for your digestive system, assist in constipation and also a great aid to improve your skin texture. 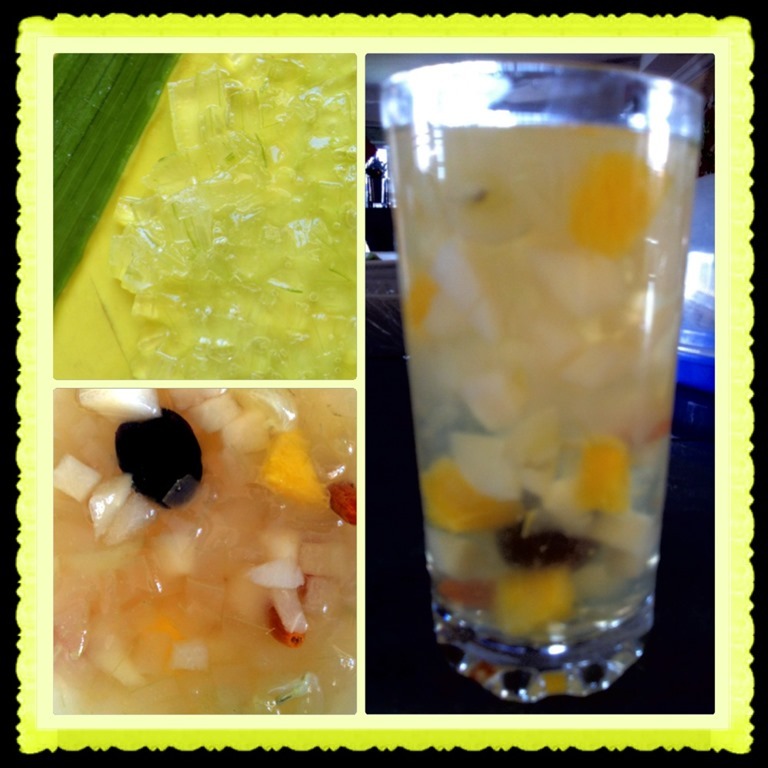 The dessert is light, sweet, crunchy, fruity and especially suitable for the working ladies. It is also a good choice after a greasy meals. It is not a difficult dessert to make. Ingredients can be adjusted accordingly if you don’t have time to dice it. Try and make a bowl of this desserts to your love one and see what is his comments. However, as like all other food, the dessert should be taken with moderation as too much aloe vera (especially with gel) can cause stomach upset. 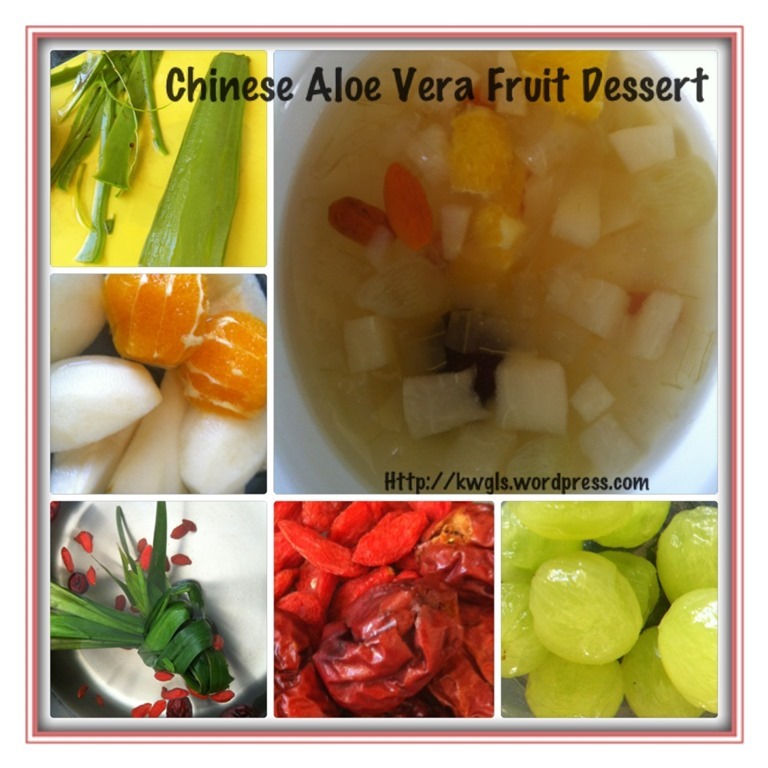 This entry was posted in Creative Food Series, Desserts and tagged 8, Aloe, CHINESE, chinese dessert, dessert, desserts, food, Fruit, ingredients, Ladies, malaysia, Medicine, moderation， goofberry， fruits， RED DATES， 芦荟，postaday, singapore, Sweet, system, texture, Traditional, Vera. Bookmark the permalink.